From time to time I am pleased to undertake pro bono work to support local organisations and individuals. Therefore I was delighted to respond to a request from Cheltenham tennis player Tom Mellor and his father Philip. Tom, who was born with Velo-Cardio-Facial-Syndrome, won gold and silver medals at the 2014 this year’s INAS World Tennis Championships. INAS is the organisation for para-athletes with an intellectual disability. Tom had a chance of playing an exhibition game on behalf of Special Olympics GB immediately before the first match at the ATP Champions Tour at the Albert Hall in December 2014. However Special Olympics GB needed to provide proof of just how talented a player Tom is. Tom’s Dad Philip asked if I could shoot some footage of Tom playing, to use for this purpose. You can see the promotional footage below. I’m pleased to report that the video has helped Tom secure a 15 minute exhibition match with his partner Fabrice Higgins at the opening of the ATP Champions Tour on 3rd December. I’ve been producing a monthly email newsletter for Winchcombe-based British Bespoke Auctions for three years. Following the most recent newsletter, I was delighted to receive this unsolicited testimonial from business owner Nicholas Granger. I just wanted to write a few words to thank you for your positive input into our business over the last three years. You are always there when we need you, and as owner operator you understand our needs. You have taken our business email marketing from nothing to something amazing. I’ve been working with West Midlands based Gala Events for five years and recently I produced my eighth film for them. This latest event was a Lord’s Long Room Lunch and it featured cricketers Michael Vaughan, Tim Bresnan and Steve Harmison. After a tour of the grounds, guests were entertained with a Q&A with the cricketers hosted by former cricketer and England selecter Geoff Miller. If you’d like me to film your event do get in touch for a chat. YouTube has just launched a new feature which enables you to add a three second intro video to your YouTube videos. It only takes three easy steps to set up and you can read more about this here. Easter Sunday 1964 saw the launch of legendary radio station Radio Caroline. Moored off the Essex coast it brought pop radio to the UK in a way that had never been done before. The station and others like it, revolutionised music radio in the UK. As a lifelong fan of offshore radio I was determined not to miss out on the 50th anniversary celebrations. I made the long trip from Cheltenham to Walton-on-the-Naze to capture the 50th anniversary celebrations, organised by former Ross Revenge captain Tony “Captain Campbell” Haggis. I’ve been working with West Midlands based Gala Events for five years and recently I produced my seventh film for them. This latest event was the annual Birmingham Gold Cup Lunch and it featured live Irish band Celtic Clan, Sky Sports tipster Kevan Minter along with football pundits Matt Le Tissier and Steve Claridge , both of whom gave anecdote rich after lunch speeches. The event was ably compered by West Midlands radio legend Tom Ross. Is your carefully crafted email campaign displaying properly? Your email campaign might look great when you send it out, but what about when it reaches the other end? 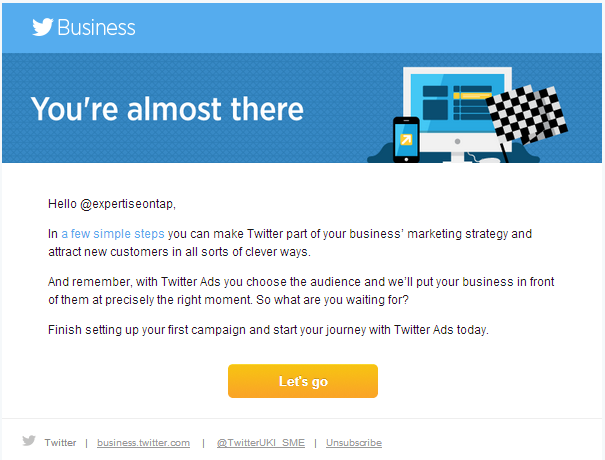 For example, here’s what happened when Twitter sent out a campaign promoting their new Twitter Ads product. The blue header “Business” which should be spanning full width, no longer is. 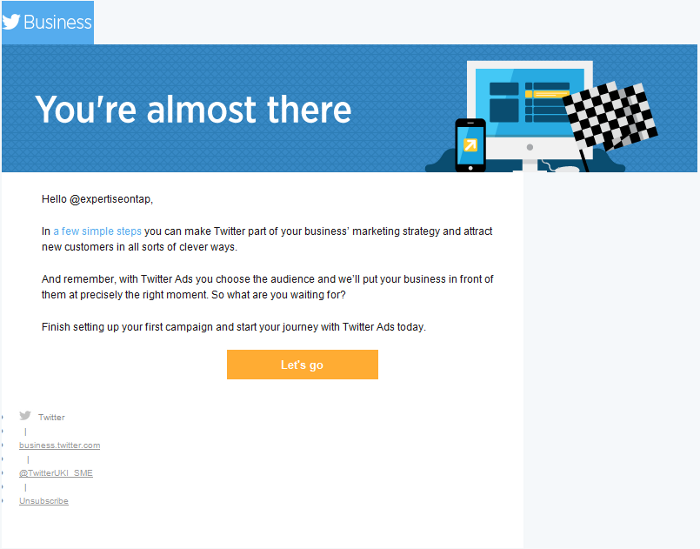 And the body text is no longer spanning the full width of the “You’re almost there” header above. The footer content is displaying vertically rather than in a neat horizontal fashion. Overall, the email is not displaying as intended, giving it a rather odd, disjointed look. Imagine if this was a printed brochure or a press advert. You wouldn’t be too pleased if it ended up like this, would you? An email campaign should be no different. To explain the technical reasons as to why this happens would take a very long blog post, however to avoid this sort of scenario I have a 21-point quality control check for every client campaign I send out. If you’re doing your own email marketing, for example in Mailchimp, send tests to a minimum of Outlook, Gmail, AOL and Outlook.com (formerly Hotmail). For the latter three it’s free to set up email accounts with these webmail providers. Test on smartphones. Definitely on an iPhone and ideally Android as well . Also test on tablet devices such as iPad and iPad Mini if you have one. If all the above sounds a bit of a kerfuffle, why not outsource your email marketing to me, so you can get on with running your business? If you’re outsourcing your email marketing to another provider, ask them how they manage their quality control. For example do they have a 21-point quality control check like I do?